↑ Kraus, P. (১৯৬২)। "Djābir B. Ḥayyān"। Encyclopaedia of Islam। 2 (2nd সংস্করণ)। Brill Academic Publishers। পৃষ্ঠা 357–359। As for Djābir's historic personality, Holmyard has suggested that his father was "a certain Azdī called Hayyan, druggist of Kufa...mentioned...in connection with the political machinations that were used by many people, in the eighth century, finally resulted in the overthrow of the Umayyad dynasty. ↑ Holmyard, Eric John, "Introduction" to The Works of Geber, Englished by Richard Russell (London: Dent, 1928), p. vii: "Abu Musa Jabir ibn Hayyan, generally known merely as Jabir, was the son of a druggist belonging to the famous South Arabian tribe of Al-Azd. Members of this tribe had settled at the town of Kufa, in Iraq, shortly after the Muhammadan conquest in the seventh century A.D., and it was in Kufa that Hayyan the druggist lived." William R. Newman, Promethean Ambitions: Alchemy and the Quest to Perfect Nature, University of Chicago Press, 2004. p.181: "The corpus ascribed to the eighth-century Persian sage Jabir ibn Hayyan.."
Aleksandr Sergeevich Povarennykh, Crystal Chemical Classification of Minerals, Plenum Press, 1972, v.1, আইএসবিএন ০-৩০৬-৩০৩৪৮-৫, p.4: "The first to give separate consideration to minerals and other inorganic substances were the following: The Persian alchemist Jabir (721–815)..."
Dan Merkur, in The psychoanalytic study of society (eds. Bryce Boyer, et al. ), vol. 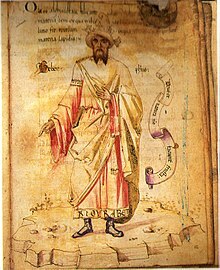 18, Routledge, আইএসবিএন ০-৮৮১৬৩-১৬১-২, page 352: "I would note that the Persian alchemist Jabir ibn Hayyan developed the theory that all metals consist of different 'balances' ..."
Anthony Gross, The Dissolution of the Lancastrian Kingship: Sir John Fortescue and the Crisis of Monarchy in Fifteenth-century England, Paul Watkins, 1996, আইএসবিএন ১-৮৭১৬১৫-৯০-৯, p.19: "Ever since the Seventy Books attributed to the Persian alchemist Jabir Ibn Hayyan had been translated into Latin ...."
↑ Julian, Franklyn, Dictionary of the Occult, Kessinger Publishing, 2003, আইএসবিএন ০-৭৬৬১-২৮১৬-৪, আইএসবিএন ৯৭৮-০-৭৬৬১-২৮১৬-৩, p. 8. ↑ ক খ S.N. Nasr, "Life Sciences, Alchemy and Medicine", The Cambridge History of Iran, Cambridge, Volume 4, 1975, p. 412: "Jabir is entitled in the traditional sources as al-Azdi, al-Kufi, al-Tusi, al-Sufi. There is a debate as to whether he was a Persian from Khorasan who later went to Kufa or whether he was, as some have suggested, of Syrian origin and later lived in Iran".